15 little Nanomeks got lost on the Eidolon. They need your help to savely reach the teleporter. 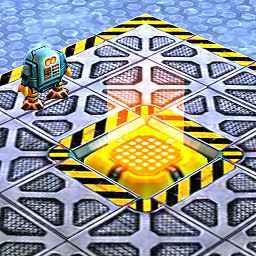 You have to save at least 10 Nanomeks to successfully complete this level. This is only 1 level I made around christmas last year, even before there was an option to upload User Adventures available. My intention was to learn Mr.Robot's public API while also learning lua. I lost interest when only about 5% was still to be done. Today I found the time to finish it. I hope you'll enjoy. I'm happy about your feedback. In the 'non standard puzzle' area, Asimov will fall into about half the blocks he jumps on. If there's no way to correct this using lua (mabye theres some type of invisible solid object that could move along with the blocks) you could try to restrict Asimov from jumping on top of the blocks. Making the half crates into double-stacked whole crates would prevent asimov from getting on top. So would putting in a low ceiling, but both of those might restrict view too much. Replacing the half crates with fire pillars or some other damaging object might do the trick. Asimov's energon count could be overriden to show the number of lemmings .. er.. nanomeks. For example, start him with 15 energon and make him lose one everytime a nanomek dies, or give him one energon for every time a mek reaches the teleporter. I love how the crushed engineering blocks are stacked with crazy rotations! This is a known bug (either of Mr.Robot or my level :-)). Unfortunately there is no transparent dynamic object I could move along. Fixing this issue using lua would be quite complicated (if possible at all). And I do not want to prevent the player from jumping on the crates, as is would look (and probably feel) not correct. Currently I can live with this drawback of my level. Maybe there is a fix of this issue for Mr.Robot some time, as I noticed a similar problem in another user adventure, IIRC. But thanks for your comment on this! Some technical background: The crates are position 2/256th of a block's size below their normal position. This would normally make them fall through the floor. So my lua script basically (re)positions every block each time the script is called. (As the script is called before a frame is drawn, but after the "physics" operations were done, this works just fine.) Unfortunately sometimes Asimov slips between the crates due to this trick. I have to position the creates some pixels lower as otherwise the crates would be visible through the left and right "border" floor tiles (on top of which the arrows are shown). I really wanted to do this, but don't know how. There is a lua command which allows taking away energon from the player. But there seems to be no way to give energon to the player -- at least no way I know about. Please, Fost or Poobear, correct me if I'm wrong. Did you beat the level, by the way? yes, on my third try. I wasn't fast enough to save all 15 though. You should have enough time to save all of them easily. you need the half-block to divert them as soon as they come out of the door and you need a whole-block from above the door to keep them in the circle. It takes me too many tries to make the 2-blocks over, 1 block up to a MOVING platform jump and the first few guys go splash before i have a chance to round them up. Curse my metal body. I wasn't fast enough. It's all my fault. Yay, active! It took me about ten tries to be quick enough to save 15..